Today I am having a Cinco de Mayo party --- would you like to come amigos? Before we eat, you may want to enter my giveaway. 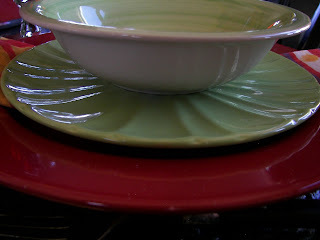 Click on GIVEAWAY or click on the kiwi Le Creuset baking dishes in the top left of my blog. 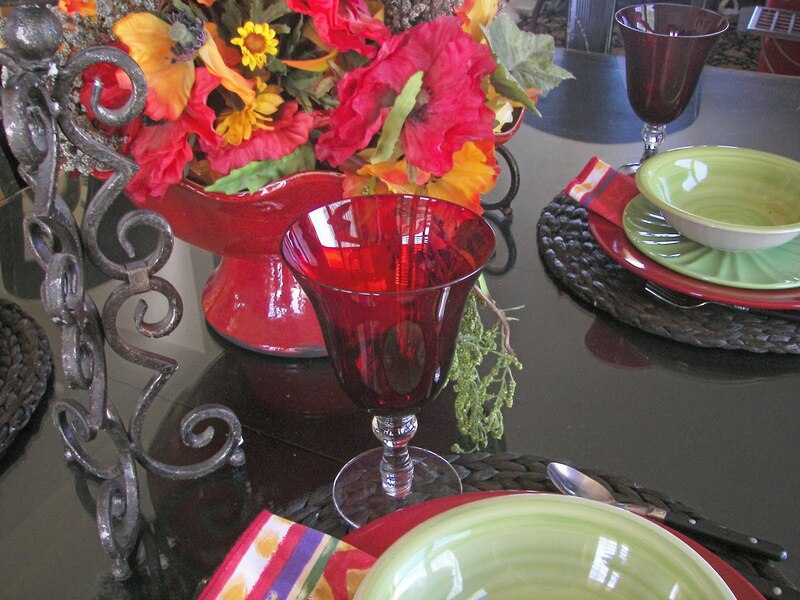 This is your placesetting set with storied ruby glasses. My Aunt Ionia always set the adult table at Christmas Eve with her ruby glasses that she stored in her beautiful bowed hutch. Many years later after those wonderful Christmas Eves, my sisters presented me with a set of eight ruby glasses. Then I bought another set to make 16. My sisters also have their own sets. You can see that my Aunt's glasses really made an impression on us! Another view of the glasses with the light streaming in. I love these very versatile red plates I bought at Wal-Mart years ago. I use them for everything. 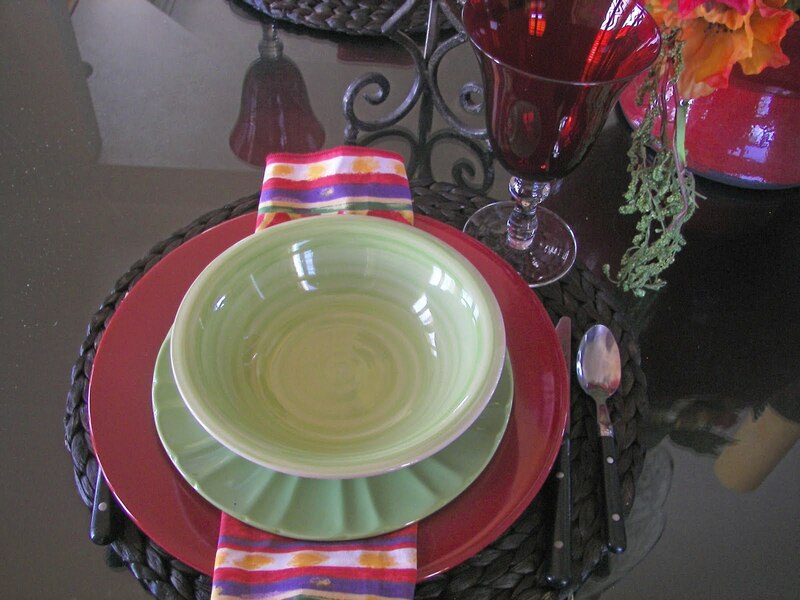 The little salad plates were bought this year at Smith's grocery store and the green bowls were bought at the Dollar Store several months ago. You may have seen these pretty napkins before at my table; I love them! They were a gift from a sister-in law. I recently acquired the placemats; they are at Wal-Mart and I think they add so much. I love how the floral arrangement gives a pop of color. It usually resides on the coffee table in my red couch room. 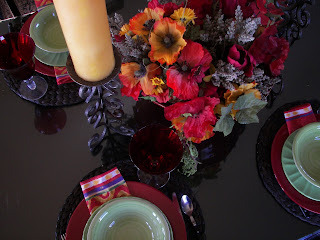 I also love the yellow candles with the red floral centerpiece. 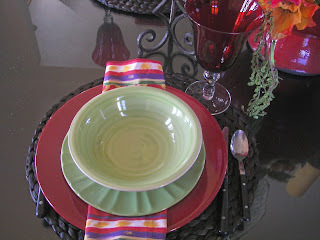 Thanks for dropping by my Cinco de Mayo Tablescape. Come take a gander at the rest of the tablescapes hosted by Susan at Tablescape Thursday Between Naps at the Porch. 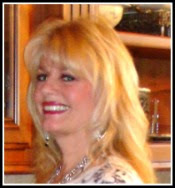 Happy Cinco De Mayo to you, I love it, so fun and vibrant, enjoy the day! 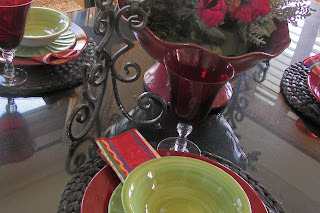 I love the mix of colors...Cinco de Mayo makes for a happy table. What time is dinner? 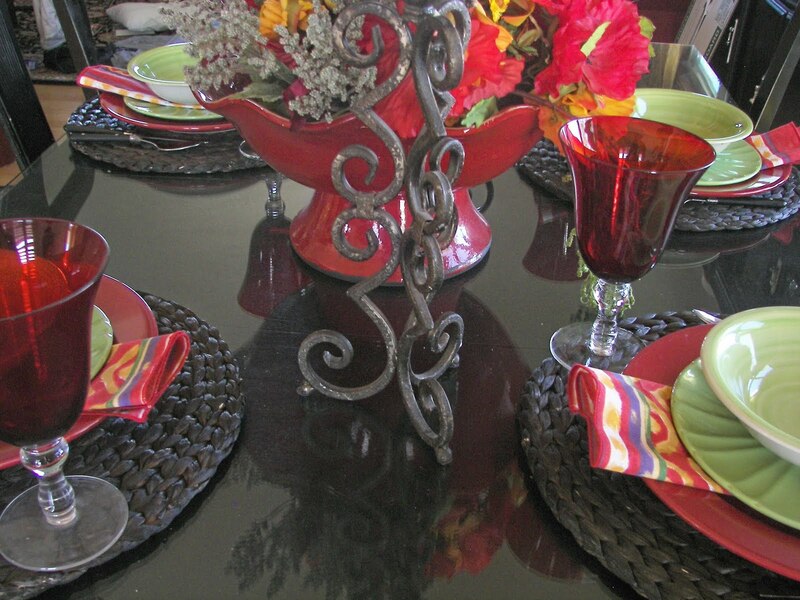 What a nice festive table...I can see why you fell in love with your aunt's ruby glass, very pretty. Very pretty and festive table. I do love those ruby glasses! Muy bonita! Love it, enjoy! Love the red glasses. Happy 5th to you! Dropping by from BNOTP. Joni, What a pretty setting. So colorful. I love the ruby goblets too! Oh how pretty! That's a very fancy fiesta table...Love all the colors! And the story of he ruby red glasses, loved that. And it is amazing what things leave an impression on us! Very pretty! 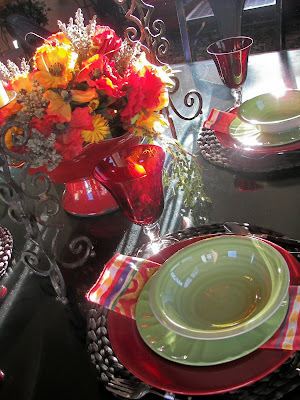 I did a Cinco de Mayo tablescape too. It's so fun to see others doing the same thing with a whole different look. 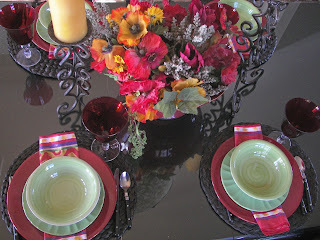 I think it would be fun to have themed tablescape thursdays to see what everyone comes up with. Joni, your table is muy festivo! Love the story about the ruby glasses. They are wonderful! And thanks for stopping by HFTS. I always appreciate your visits. Muy alegre y festiva, las copas rojas le dan el toque especial. A fiesta! I'm glad I was invited! What a colorful tablescape, so perfect for Cinco de Mayo. Beautiful glasses. Such a beautiful tablescape! And I ADORE those candle stands.....!! Where on earth did you find such a lovely pair??? Great job!! Hope you will tell us! Great table. Very festive and pretty. Love that red accented by the bowls. Lovely. Your glasses are truly an heirloom look, your Aunt knew what she was doing passing that love to you and your sisters. Great story. This is just gorgeous! I love the color combination you used. Of course I totally love the ruby glasses!! Love those chargers too! Beautiful! 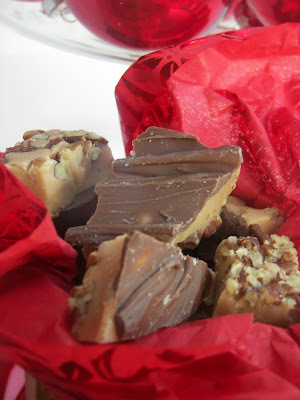 I was unable to resist a blog entitled "Red Couch Recipes"! The tablescape is wonderful! Beautiful! Your red glasses caught my eye first. I love them. Beautiful glasses & so pretty settings. Ty for sharing, I be there soon. Your glasses are beautiful, but the family memories are priceless! 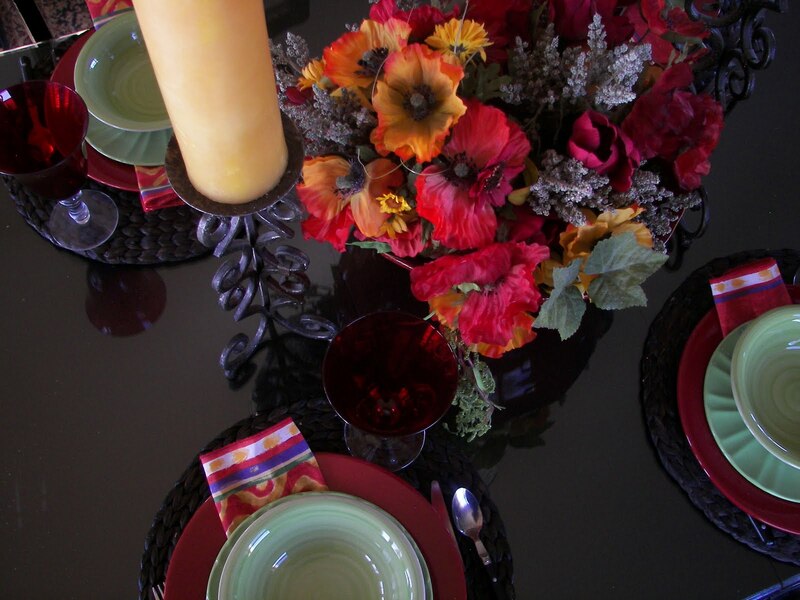 Thanks for sharing your colorful tablescape. I love the green bowls. What a great tablescape! I am fortunate to live in a place that has so much for moms. Vibrant! Gorgeous!! Amazingly well done!